Instead of junk emails and bad news, why not find a poem in your inbox, or several? 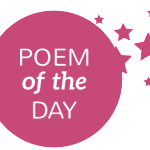 Here are some links to free “Poem of the Day” lists. Send an email and ask to be included.